There are jumpers with this set. 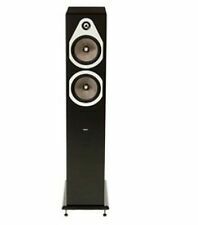 Audio Classics, Ltd.
Energy Veritas V-2.3 Speakers Piano Gloss Black. Both cabinets are delaminating, comes in original boxes. Will post pics soon. Quoted shipping is for one box, actual shipping will be double quoted price since there are two boxes, one for each speaker. Model:Veritas V-5. he V-5.1 speaker allows you to truly indulge in your favorite movies and music. As the speaker emits accurate and distortion-free sound throughout your living room, its contemporary finish effortlessly blends with any décor. Sensitivity: 2 speakers in a typical room: 90dB. Very small holes on couple of corners on grills hardly visible. Drivers are in perfect condition. Cabinets are in very good condition. If item is used, it has been used previously. Finish Piano Black. Power Handling up to 250 watts RMS. Included Accessories Spike kit, rubber bumpers, high gloss black base/plinth, port plugs. Woofer Two 6.5" woofers with kevlar cones and Ribbed Elliptical Surrounds. 1 6-1/2" Dual Hyperdrive Woofer, 2-3" Mid Band Fill Drivers. Speaker System: Acoustic Suspension. Cabinet Finishes: High Gloss Black finish with Reversible Cherry or High Gloss Black Side Panels. Minimum Impedance: 4 ohm. It's truly music to the eye and ear. •Woofer: Two 6.5" woofers with kevlar cones and Ribbed Elliptical Surrounds. Your Yamaha Connection. The other one is not available here. (Unless you want the other one in Rosenut finish. ). You are purchasing a pair of audiophile Energy Veritas 6.2 in mint condition with magnetic covers, Speakers look beautiful and sound incredibly clear. Energy Veritas 2.2 Speaker Grills. See the photos of the actual items for sale. Included here will be a pair of 2.2 speakers, the matching 2.0C, a pair of matching 2.0R speakers, and the smaller sub, the XL-S8. The plastic gloss black sides seems to be loose like to many of these are. Energy Veritas Piano Black 2.8 Class "A" Rated StereoPhile Recommended Speakers! They are in perfect functional condition and the grills are included. Bought these YEARS ago from Energy and never had a need! 1 Energy Veritas 2.0 Ri Audiophile Suround Sound Gloss Black Speaker. Condition is Used have scratches and scuff you get the exact item in pix please look at pix before buying have . Best speaker ever . Sound great tested . speakers show ware on corners off speaker and on side . For sale is a pair of Energy V2.1 monitor reference speakers with original Energy stands. Used, but in over all VERY GOOD shape. Original speaker stands & speaker grills/ covers included. (these types of scuffs are very typical on these speakers). 4DR / 51869. New,unused,box opened only to show content. Energy/Mirage parts. Denn nur ein zufriedener Kunde gibt uns das Gefühl alles richtig. im Herzen Berlins. Wir führen eine feine Auswahl anklassischen Hifi-Komponenten, vom Tonbandgerät über den. Ebenfalls sind wir Ihr Ansprechpartner in sachen Restauration, Reparatur und Ankauf.